Aurora Multimedia provides video distribution and control solutions for a variety of global markets, including government, education, security, hospitality, corporate, and house of worship. Aurora Multimedia products incorporate state-of-the-art technologies that surpass typical specifications and features. Their history of innovation – from the introduction of the industry’s first non-proprietary, Web-standards-based IP control systems and touch panels, to today’s advanced HDBaseT™ and IPBaseT™ IP video distribution solutions – has made them a dominant force in the AV industry. Founded in 1998, Aurora Multimedia manufactures products in their own facility in Morganville, New Jersey, USA. Having an in-house production line gives them the flexibility to customize and innovate more quickly with better control over the manufacturing/quality process, and the ability to customize to meet end-user demands. 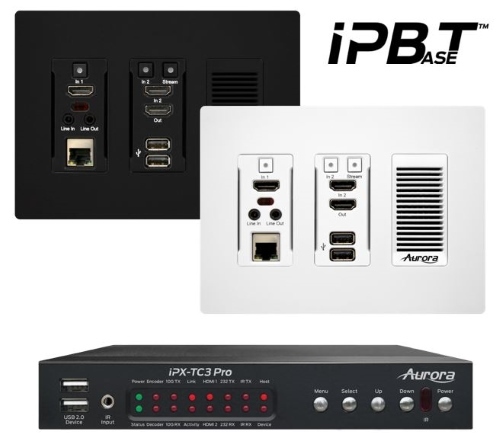 Aurora’s IPBaseT® combines a variety of 4K IP technologies and features under one unifed protocol using a simplified topology. Uncompressed video with zero-latency, visually lossless video with low latency, seamless switching, video wall and multiviewer modes, Dante and AES67 digital audio, USB 2.0, Ethernet, and control are just some of the core capabilities of IPBaseT®. Utilizing the bandwidth of a standard 1Gbps copper (VLX Series) or 10Gbps copper or fiber (IPX Series), IPBaseT® supports large scalable audio/video matrixing, and it does so while replacing multiple technologies and products with a "single-box" distributed platform. The days of needing a separate AV switcher, control system, Video Wall processor, audio/DSP converter, and more are a thing of the past! 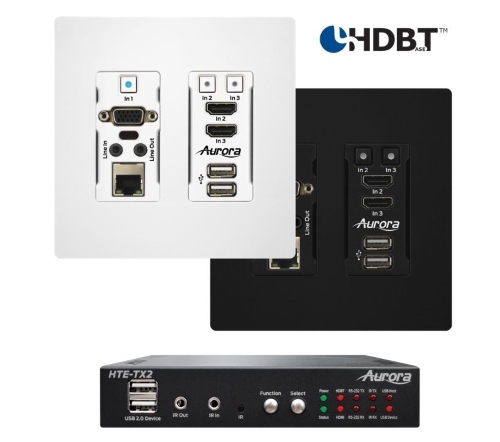 Aurora manufacture the most advanced HDBaseT extenders on the market. The HT Series with HDBaseT 2.0 is capable of extending 4K60 4:4:4 & HDR (18Gbps) 100m (330’) with unshielded cable. In addition, directional USB allows a user to choose which side the host (PC) vs the device (peripheral) will be located. Built in IP port expansion allows any 3rd party control system to send commands directly to the unit for source switching, RS-232, and IR control. 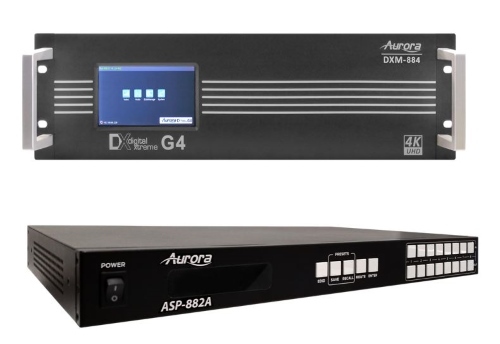 Aurora is the only product to allow a single PoE port power both the TX and RX at the same time with no wall supplies required for a very clean installation. 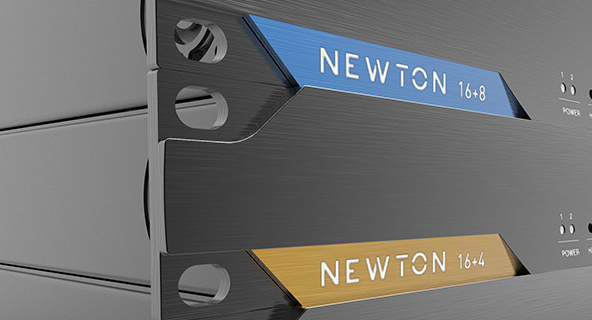 For easier integration into an audio system, the HT Series is the only HDBaseT™ product to have optional Dante™/AES67 up to 8 channels for surround sound. Confidea® - now the 3rd generation - features a powerful combination of technologies, developed by Televic engineers with years of experience in the development of highly reliable wireless conference systems. This 3rd Generation Confidea® has been developed from the ground-up, building on the experience of the previous generations and making use of state-of-the-art Quad-Band wireless technologies, fault-tolerant error correcting protocols and advanced encryption algorithms. With systems operational in nearly 60 countries, Confidea® is the most robust and secure wireless conference system available on the market today. 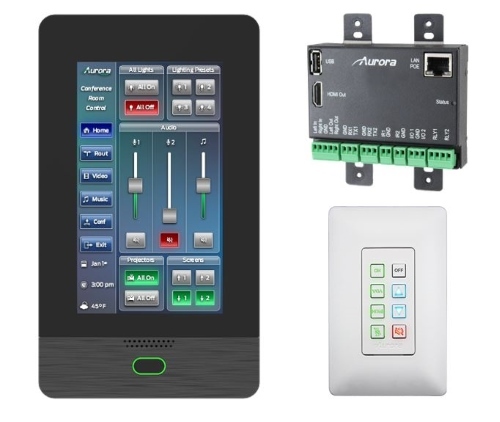 Aurora control systems are available in multiple form factors including integrated touchscreen controllers, button controllers, standalone control processors or expansion boards that allow control the functionality of a control processor to be embedded in an IPBaseT or HDBaseT video endpoint.